We’re back in Granvallen! It feels like it’s only been moments since we left the floating continent of Ilvard, only to journey back to where it all began in the land of Arges with Pipiro and Pokkle. 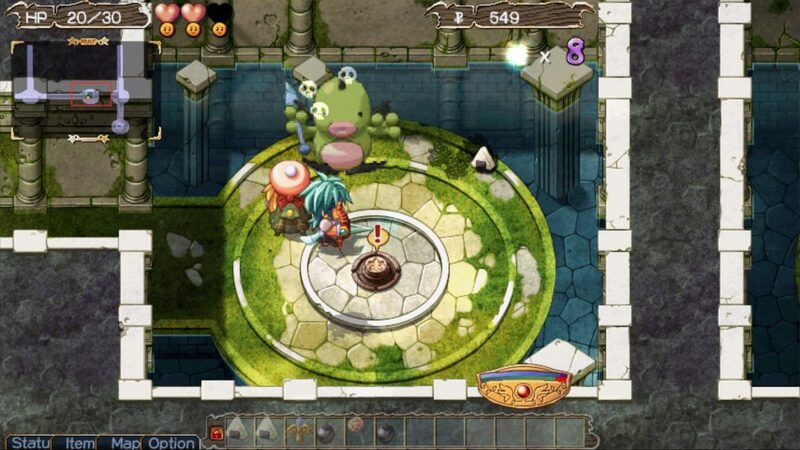 Zwei: The Arges Adventure is not quite as entertaining of a journey as I was expecting after playing the sequel, but it still resonated with all of the charm and classic gameplay that you’d expect from a Nihon Falcom game. It admittedly felt a little bit odd to be playing the first game so soon after playing the sequel, but it gave me great perspective on the type of combat and wacky narrative that was in store for me. 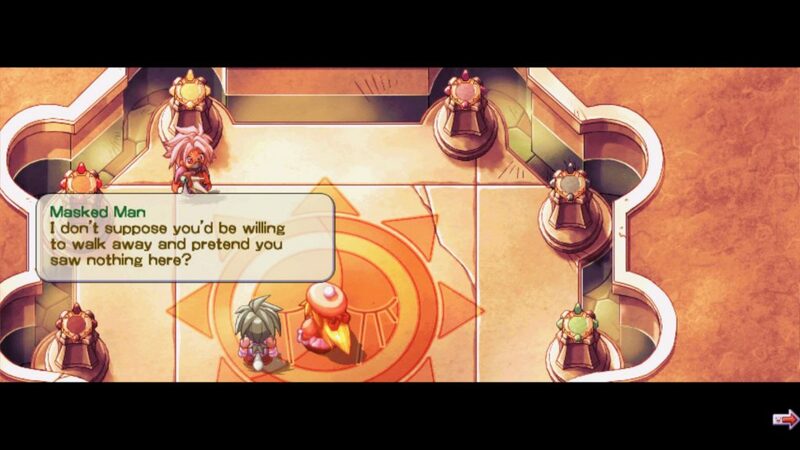 The narrative of the first Zwei game follows Pokkle and Pipiro as the two step-siblings seek to track down a master thief who robbed the Aplieste Shrine and made away with six sacred idols, vanishing without a trace. An insistent Pokkle decides for the pair that chasing after the idols before they were smuggled out of Arges was the best course of action, and after a large reward for their return is announced, Pipiro has no choice but to tag along, and it assuredly has nothing to do with all of the shopping she could do with the reward money. The land of Granvallen is one where magic is not exceptionally common, and machines have taken over a lot of the functions in life, making for an interestingly juxtaposed low fantasy setting. 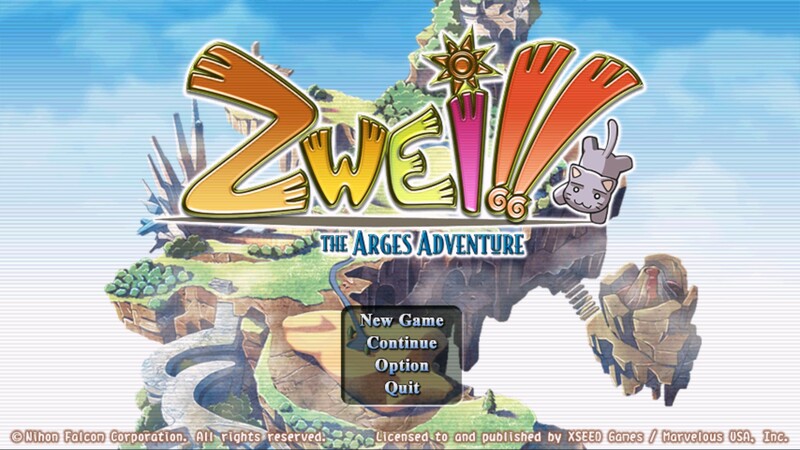 Zwei: The Arges Adventure initially released in 2001 on PC as Zwei! !, and featured subsequent releases across the PlayStation 1 and PlayStation Portable systems, all exclusively in Japan. 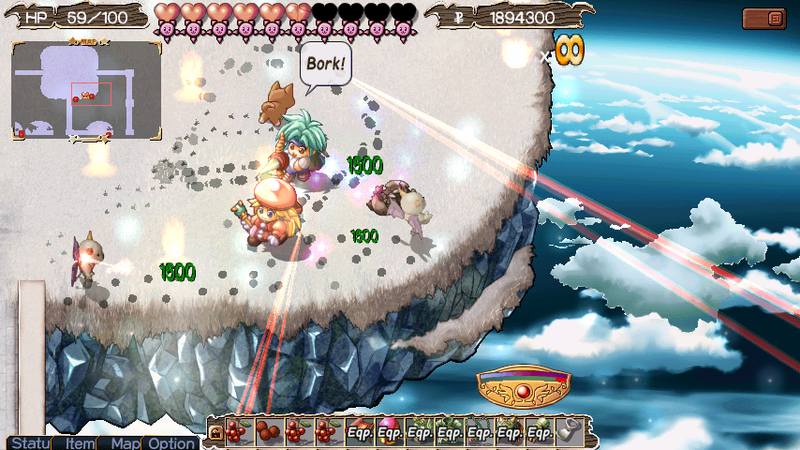 This most recent localization has brought Zwei worldwide, one of the numerous titles that has been imported by XSEED and Marvelous USA in recent years. I know I’ve said this before, but it really is fantastic that an entirely new generation — not to mention multiple continents — get to experience these localized titles. The original Zwei story is as full of puns and hilariously cheesy one-liners as the sequel, and I’d argue maybe even more so. Since Pipiro and Pokkle have a longstanding history as awkward step-siblings, their dialogue features that sense of closeness that comes from a lifetime spent together. The two are hilariously diametric characters; Pokkle is an excitable and punny craftsman seeking glory, and Pipiro is a sarcastic and fashionable mage after her fortune. The pair is sure to charm newcomers to the series, and their dialogue is consistently poignant, entertaining, and full of jokes. Chasing after the stolen relics takes the pair all over Granvallen, which is a wonderfully designed continent full of unique laces and interesting characters to discover, with the combat exclusively relegated to some deep dungeon dives. 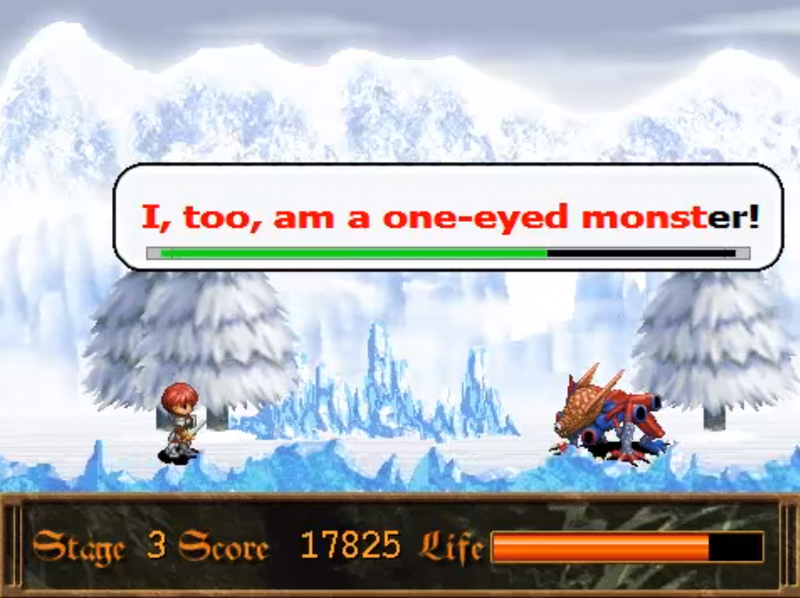 In many ways, Zwei: The Arges Adventure is controls very similarly to The Ilvard Insurrection with some notable differences. As the name suggests — zwei means “two” in German — you are able to switch who you are controlling between Pipiro and Pokkle in The Arges Adventure with the press of a button, allowing you to enjoy adventuring or battling as either of the step-siblings. Pokkle uses the Anchor Gear which allows him to strike at foes within a relatively close proximity. Pipiro on the other hand uses magic to engage enemies at range, but until you can customize her spells the two largely perform a very similar function in combat. Whereas in Zwei II the differences between Ragna and Alwen’s combat styles were apparent and useful from the start, the ability to switch between Pokkle and Pipiro felt less necessary in Arges for the first little while. This being said, as much as the combat and general gameplay is very similar to Zwei II, I found it to be less malleable and more repetitive. Attacking is done by pressing a single button and aiming towards your enemy, although it auto-targets the closest enemy so you often don’t need to aim. You have to try and time your attacks in relation to a fluctuating gauge to effectively land critical hits. It’s an odd system, which forced me more often than not to be looking at the bottom right of my screen to make sure my attacks were in tune with the ‘red zone’ — which signified a critical hit — instead of watching the battle itself. The more I played the more I was able to feel out the timing; it was almost like pressing the button in time to a rhythm game with a visual cue instead of an audio one. Timing your attacks along with the critical hit gauge and keeping them in general rhythm allowed me lock the opponent in a state of ‘juggling’ to chain attacks and stop them from returning fire. The combat did start to feel quite repetitive as I progressed through the game, but as the narrative progressed and my characters became more powerful, the gameplay definitely opened up more, even if it the combat itself lacked substantial flow. Since your attacks with either of the siblings auto-lock on the nearest enemy — which can be exceptionally useful if you’re not pointed in the right direction — it enforced the fact that in many battles you can just jam the A button or left mouse button and ultimately walk away victorious. It’s not really even necessary to switch between Pokkle and Pipiro for the first portion of the game, because Pokkle’s lunge gives him almost as much range as Pipiro’s core magical attacks. Luckily, experience to level up your characters and expand their combat capabilities can be found literally strewn around dungeons, stored in conveniently placed pots or dropped by slain foes. I’m talking of course about food! 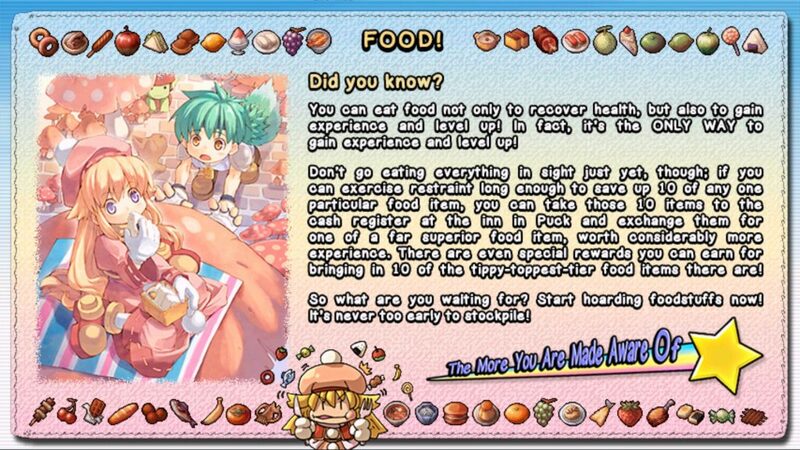 Both experience and health are based off of eating food in Zwei: The Arges Adventure, so you want to make sure that you spend time searching through dungeons to maximize your pantry! Different types of food give you a different ratio of health versus experience, and saving up ten of the same item will allow you to trade them in for a super dish which gives a large amount of experience. While combat between the two games in largely similar, visually The Arges Adventure is very different. Compared to the backdrops in the sequel, we are treated to some beautiful hand-drawn environments, versus the more modern style of digitally rendering everything. It’s refreshing to be playing a game with this type of artistic style again, because it’s not something we see as often lately, even in more classically stylized RPGs. 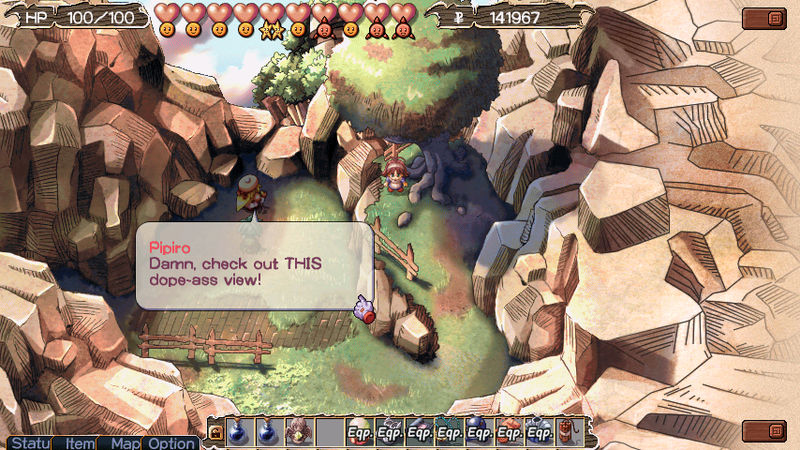 It’s really a beautiful game, and I enjoyed taking in all of the sights of the towns and landscapes between dungeons. Even the interiors of buildings were exceptionally well drawn with layers of detail. The dungeons on the other hand got a little visually repetitive, but this was a very common aspect of early 2000s JRPGs which often featured a multitude of dungeons scattered throughout, with 99 floors to fight your way through in each. Suffice it to say, Zwei: The Arges Adventure is not a small game by any stretch, even though you can beat the main story in about 25 hours. There are a host of extras to that have been added into the re-release, including addition side-content and a host of unlockables. Tee inclusion of three minigames is an awesome addition to the package, even if I found it hard to play the aeroplane shooter or Tetris-esque block game because I was too busy destroying the Ys Typing Tutor — Typing of Ys — which may easily be the best typing game that has ever been created. And while you’re delving through 100 levels of dungeons, scarfing down all the food you can eat, you’re treated to a delightful remastered soundtrack. You can also switch the background music, from the original 2001 soundtrack to a bonus arranged version which was included in the 2018 localization and is just fantastic. Since discovering it in the settings, I’ve only switched back to the original score a few times to note the differences between the two. The original tracklist maintains the nostalgic feel of early 2000s JRPGs, with the arranged version adds a little “bounce” into the rhythm, making it almost impossible not to tap your feet along. Unlike The Ilvard Insurrection which gave you a lot of control over the graphics and controls through an external configuration tool, you are locked into 854×480 but able to scale it up to your fullscreen resolution. Luckily though controller support in Arges is absolutely plug-and-play, allowing you to utilize Steam, Xbox, or even PlayStation 4 controllers if you want to relive the glory days of the PS1 release. After playing the previous game with a mouse & keyboard I wanted to give the gamepad a try, and to my pleasant surprise it was expertly mapped and made for a much more comfortable experience. I ultimately had a fun time with Zwei: The Arges Adventure which was helped exceptionally by the fact that it’s impossible not to smile at the adorable and personality-filled world. Even the monsters are full of character, and I knew that in every new dungeon or town held a new story or character that I would undoubtedly love. I just found that the combat in Arges was not near as captivating as I had expected it to be, and many fights devolved into me mindlessly pressing the A button in rhythm with that fluctuating gauge. If you’re hungry for more Zwei, there is no doubt that for the asking price you will find yourself entertained with the new host of characters and familiar combat style, but for newcomers to the series I’d recommend starting in Ilvard. Zwei‘s beautiful world and engaging narrative helped to lift up a game ultimately hindered by repetitive combat. XSEED Announces Western Release of Zwei! !